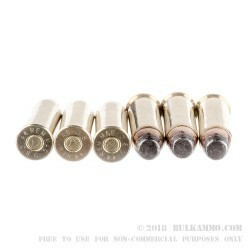 A clear bargain choice when shooting .44 Magnum ammo due to the price point, but perhaps a bit of a sleeper too, given the exceptional quality of the component parts that make up this load. 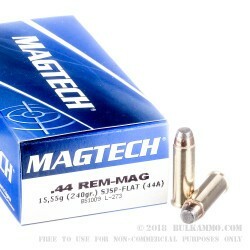 The MagTech .44 Magnum 240 grain semi jacketed soft point is a very nice cartridge with competitive ballistic numbers and a very clean powder relative to other bargain loads. 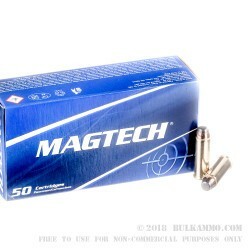 The combination of this clean burning powder relative to competitively priced peers, makes this load stand out among the bargain offerings, but the added benefits of the consistently performing projectiles and the great quality of the rounds for the money, makes MagTech a serious candidate for many shooters. High quality reloadable brass cartridge casings and the boxer primer means you get reliable ignition that’s priced below the competition with superior components. The moderate load values of 1180 feet per second of velocity and 740 ft. lbs. 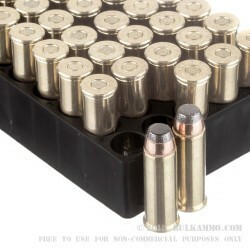 of energy out of the muzzle gives one pause, considering the hot deal on this 1000 round case that is offered by BulkAmmo. The clear cut choice here is whether you want a bargain round that can do what the rest can do but at a better price, or if you want to go with the crowd and pay more for the same thing by utilizing another brand name.